It's the strikingly symbolic National Center for Civil and Human Rights (NCCHR). Freelon will join veterans of the civil rights movement at an event that's timed to coincide closely with the 50th anniversary of the Civil Rights Act of 1964, signed into law by Lyndon Johnson on July 2, 1964. 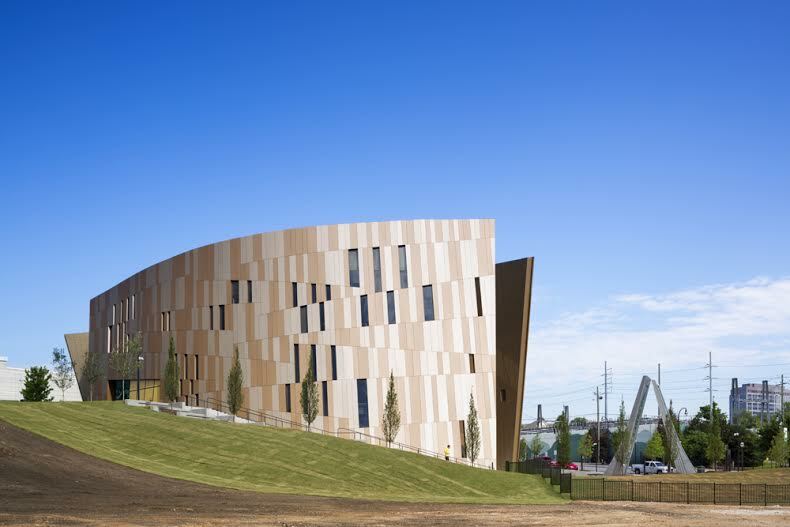 Freelon's firm, teamed with architect of record HOK, was named a finalist in a 2008 competition for the project, winning over designs by Diller Scofidio + Renfro and Polshek Partnership (now Ennead Architecture), among others. "We'd made a presentation to the public and talked about the idea for the building, with models and renderings, music and historical imagery, and readings of poetry," Freelon says. 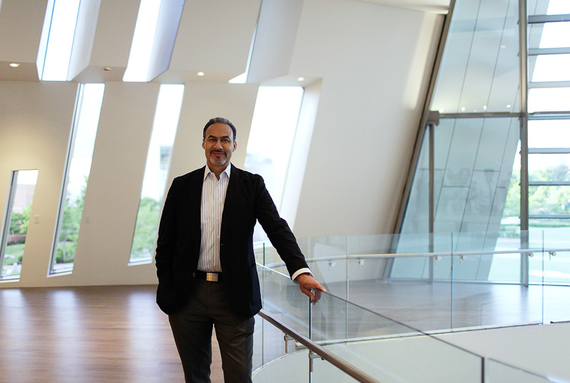 "Long-story short, we won - and then people said: 'Who's Freelon?'" Word hadn't yet reached Atlanta about the soon-to-be-named architect of record for the Smithsonian's Museum of African American History and Culture on the Mall in Washington, D.C., scheduled for completion next year. Freelon took it in stride. Then he turned to address the formidable effects of the Great Recession on the new project. "It went from 93,000 square feet to 61,000 to 42,000," he says. "When it's 93,000 or 61,000, it can sit on site the same way. But at 42,000, it's different." Still, his original concept of two facing walls, embracing each other around a central open space, endured. Those walls are clad in architectural paneling that varies in brownish tones, with Corbu-like fenestration that delivers light deep into the building. 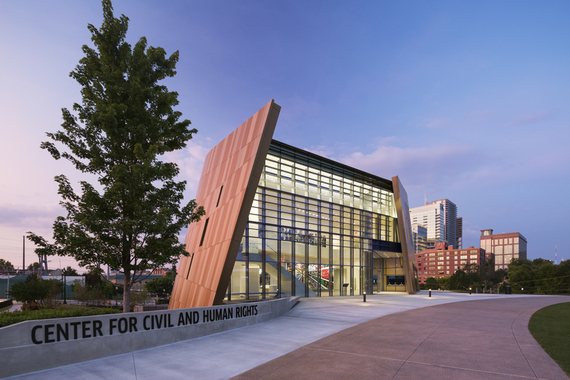 Much of his design for those two walls was inspired by arms linked courageously and in unity during the brutal and deadly civil rights struggles of the 1960s. "Civil rights in the U.S.is a very compelling issue and here it's told in a way that's engaging and immersive, against a larger issue of global human rights," he says. 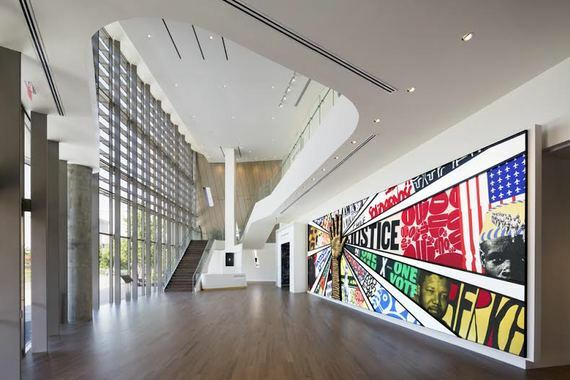 The center tells its stories on three levels, beginning with an anchoring gallery on the lowest, dedicated to the Morehouse College Martin Luther King Collection. Floating above it is a series of exhibitions and galleries addressing civil rights. Above that is a third level of exhibitions on global human rights. The exhibit designer is New York-based Rockwell Group. Located adjacent to the World of Coca-Cola and the Georgia Aquarium in downtown Atlanta, the building awaits future additions to bring it up to its original, expansive vision. "As we add significant wings for the extended program, it will look complete and balanced," he says. "We didn't want it to look unfinished at the beginning, so lot of effort was put into configuring things, so some will come at a natural progression as funds become available." Opening ceremonies begin at 10 AM on Monday, June 23. On hand will be U.S. Rep. John Lewis (D-Ga), former U.N. Ambassador Andrew Young, representatives of the Martin Luther King family, and former Atlanta Mayor Shirley Franklin. 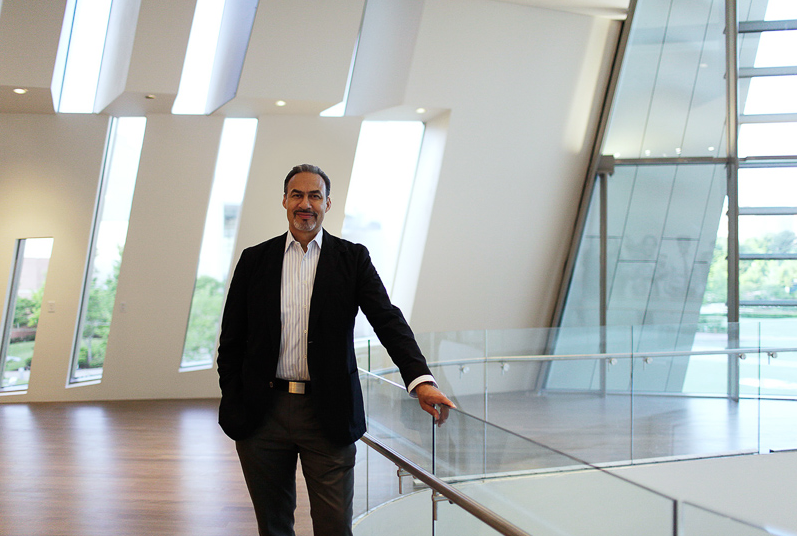 By the time it's over, most in Atlanta will be familiar with the work of Phil Freelon. J. Michael Welton writes about architecture, art and design for national and international publications. He also edits and publishes a digital design magazine at www.architectsandartisans.com, where portions of this post first appeared.